Looking beautiful is every woman’s prerogative, and with the fashion industry booming, this has turned to be an added advantage for her. If you know which eye shadow goes well with the black evening wear, or if you enjoy giving others useful tips and fashion ideas, a great future beckons you. Ample opportunities– When you are a certified makeup artist, you can find plenty of job opportunities in the field of modeling, advertising and films. Initially, you can start off by working for a prom night or a wedding and later diversify as you gain experience. Highlight your skills in your portfolio, and before you know, you will be styling your favourite celebrity. 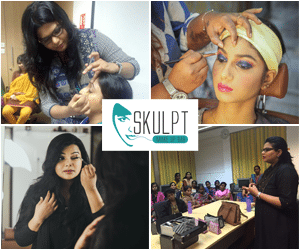 Upgrade your skills- If you are keen on starting your career as a makeup artist, you must stay updated on the latest skills and obtain a strong foothold in your chosen area of interest. When you join a makeup academy, you get expert guidance, and they equip you with the right skills. The glamour industry is changing each day, and you must stay updated about the latest trends by reading fashion magazines and articles. Lucrative jobs– Think of this. When you start to work in a famous salon, or you set up your own spa, you get a good opportunity to meet celebrities, and not to forget the pay package that comes along. Personal stylist for celebrities- Once you complete the makeup course successfully, you can work in films and theatre as a makeup artist. Whatever are your choices, the pay and the opportunities for growth are ample. Every woman sees herself as a beautiful bride, decked in jewellery and bridal wear. When you hire a makeup artist in your city, they will help you look photogenic. Ensure that the makeup artist uses quality products for your skin, and all the tools and equipment are new and untouched. You can make your wedding a memorable event by choosing the best wedding makeup artist in Chennai. The makeup professional will highlight your facial features and conceal the flaws. With help from latest trends and tools, you are transformed into a beautiful bride, all set for your wedding. You can ask for custom styles and designs to suit your skin type and the theme of the wedding. Apart from giving your face a radiant glow, your makeup is done to perfection. When you step out with a certificate in hand, you can land a job as a consultant or stylist for a renowned brand. You can give fashion tips and ideas in exchange for money, or you can start your own academy or school to groom interested individuals. Start off small initially, and gradually you can turn into an independent salon owner. Second, you are the most sought-after person for any bride. Right from styling her hair to applying makeup to the bride to displaying your style on the international ramp, you can explore your interests and secure your future.